ISOLgate aims to make searching for data easier by doing the hard work for you. One of primary ways of doing this is through the graphical representation of data using Pie Charts and Bar Charts. These provide a general overview of the more significant potential failures and causes as categorised by the ICAM approach. Each accident / incident analysis within ISOLgate database has been assigned with relevant EMESRT Isolation Design Philosophy (DP)- Risk(s) category. This has allowed a seamless integration with the EMESRTgate portal, specifically to the Isolation DP. ISOLgate Checklist(s) is generated for each record of data to provide information specifically related to relevant EMESRT Risk category. 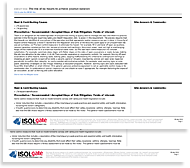 ISOLgate’s ability to provide dynamically generated, downloadable “ISOLgate Checklists” that contain industry adopted hazard mitigation practices is seen as a particularly powerful feature. What is a ‘ISOLgate Checklist’? The Checklists contain comments and what approaches have been taken by the industry to mitigate the particular hazard(s) and resultant risk thereby allowing the user to check his/her own site’s safety and health management system for industry solutions. “ISOLgate Checklists” are dynamically created and are downloadable. How Can I Access to the ‘ISOLgate Checklist(s)’? Browse by EMERST Risk – The Earth Moving Equipment Safety Round Table (EMESRT) was formally established in 2006 by a group of major mining companies from around the world. The goal of EMERST is to accelerate development and adoption of leading practice designs for earth moving equipment to minimise the risk to Health and Safety through a process of Original Equipment Manufacturers (OEM) and user engagement. EMERST forms an integral part of MIRMgate and the ISOLgate database has developed to provide seamless integration with the EMERST Isolation Design Philosophy.